In spite of the growth of virtual business activities performed via the World Wide Web, every business transaction or operation is performed at a physical place. And as handheld GPS devices drive a growing awareness of the concept of “location,” people are increasingly looking for operational efficiencies, revenue growth, or more effective management as a result of geographic data services and location-based intelligence. 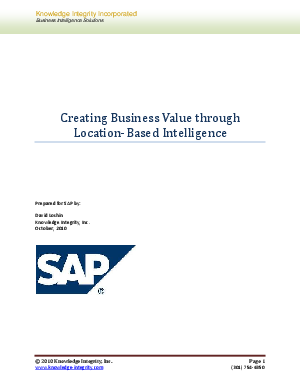 In this white paper, David Loshin, president of Knowledge Integrity, Inc., introduces geographic data services (such as geocoding and proximity matching) and discusses how they are employed in both operational and analytical business applications. The paper also reviews analytical techniques applied across many types of organizations and examines a number of industry-specific usage scenarios.